The Employer Disability Information (EDI) website has a great library of material and advice for employers, and employees, on disabilities and the workplace. A key aspect of advice for employers and employees is around the area of Reasonable Accommodation. Reasonable Accommodation relates to the when an employer changes the tasks, job structure or workplace environment in order to allow an employee with a disability to do their job to the best of their ability, while enjoying equal employment opportunities. For employers the EDI provide an easy guide to Reasonable Accommodation in order to help assess, implement and improve an employee’s working environment in order to provide the best workplace for everyone. Assess – The impact of the disability and where limitations may lie in essential tasks. Identify – Find out what are the employee’s accommodation needs. Implement – Select and apply the most effective and appropriate accommodation. Review – Regular evaluations of the applied accommodation to ensure the measures taken are working and still suitable. Follow-up – Modify the accommodation if necessary and repeat steps 1-4 if appropriate. These 5 steps are a great tool to use as a basis for providing an accessible, equal opportunity workplace where every employee can thrive and achieve the best results in their work. 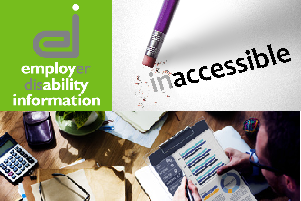 The EDI also provide a wide range of other information to help with employers realizing reasonable accommodation for their staff. Their website provides examples of reasonable accommodation, useful guides to help along the way, frequently asked questions and funding that is provided to facilitate reasonable accommodation. The resources available give invaluable information to both employers and employees on improve their workplace environment. To find out more information on Reasonable Accommodation, the 5 steps, guides, examples and funding see the Employer Disability Information website by clicking here.